You can get books from Kent Library, from over 60 Missouri libraries (through the MOBIUS book sharing program), or from libraries across the United States (through MOBIUS/ Prospector or Interlibrary Loan), absolutely free! If you are experiencing extenuating circumstances that prohibit you from accessing or retrieving materials, please contact circulation to request special accommodations. Go the the Kent Library Catalog. Search for a book by keyword, title, or author. If you find the item, hit the Request button, located below the title in your search results or at the top of the page after you click the title. In the form, enter your SE Key and password. If you have recently logged in to another service with your SE Key, such as Moodle, you may be logged in automatically. Books can be sent to Sikeston, Kennett, and Poplar Bluff. If you are an online-only student, select "Web-Only Student." The book will be mailed to the permanent address you have listed with the university. Hit the SUBMIT button. The other information does not need to be filled out. An email will be sent when you book is available to pick up. If you do NOT find the item you want in the Kent Library Catalog, hit the Search MOBIUS button to search the MOBIUS catalog. Perform your search as you would in the Kent Library Catalog. 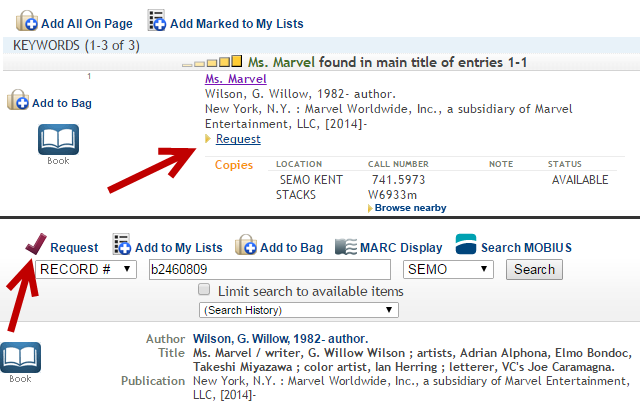 Click on the title of the book you wish to request, and then click on the "Request It" button. In the page the opens, choose MOBIUS - Southeast Missouri State University from the dropdown menu as your cluster. Click "Submit Above Information." In the form on the next page, enter your full name and your Southeast ID (S0) number plus "semo". (Example: s02345678semo). If you don't know your ID number, read finding your Southeast ID number. In the same form, choose where the books should be shipped to in the "Pickup Location" menu. You can also have them sent to any MOBIUS member library near you. To send books to a MOBIUS library, you will need to select that library's cluster in the "Pickup Cluster" menu, which changes the options in the "Pickup Location" menu. Click "Submit." An email will be sent when you book is available to pick up. Use Interlibrary Loan ONLY if you cannot find the book you need in the Kent Library or MOBIUS catalogs. 1. At the Interlibrary Loan screen, logon to ILLiad or create an account if you do not have one. You can create an account by selecting the 'First Time Users' option. All Kent Library, MOBIUS, and Interlibrary Loan books can be picked up at your regional campus main administrative office. We will email you when your books are available for pickup. You can also login to My Library Account and check the status of your requested items. Books sent from one MOBIUS library to another (example: from Washington University to Kent Library) are checked out with a student ID card. If you are enrolled in a designated web-only program, you can have your books mailed to the permanent address on file with the university. If you are unsure if you qualify, contact your instructor. When requesting books, choose the pickup location labeled 'WEB Only Student'. A postage-paid, addressed envelope will be included with your requested materials for return. You can renew your books online, including MOBIUS books. Login to My Library Account with your SE Key and password. You should see as list of your requested books. Select the "X items currently checked out link" in the left column to change to your checked out books. If you have no requests, you should be taken to your list of checked out books automatically. Check the box next to the book(s) you wish to renew. Click the "Renew Marked" button. On the new screen asking if you would like to proceed, click "Yes" after verifying the correct book(s) are listed. You will get a notification on the next page if your renewal was successful. You can also call the circulation desk at 573-651-2232 for renewals. Length of checkout period and number of renewals is determined by the library circulation policies.